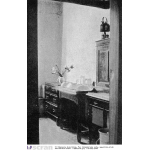 This is a black and white printed photograph titled `a peep into the surgery`, showing a room with domestic furnitre, including a wash-stand, along one wall. 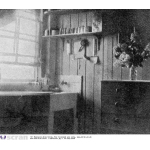 This is a black and white printed photograph titled `a corner of the kitchen`, showing a wood panelled room with shelves, chest of drawers, and a sink with a work-top. 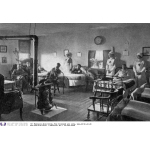 This is a black and white printed photograph titled `RAMC orderlies attached to the hospital`. 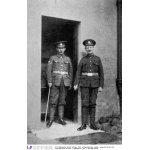 It shows two uniformed men standing outside a doorway in a wall. This is a black and white printed photograph titled `snapshot at the battery`. 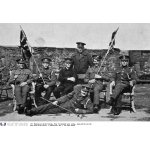 It shows a group of uniformed soldiers posed outdoors on wicker chairs and a bench; two have Union Flags.